Food purists will tell you that when a recipe calls for masa harina -- a type of ground corn flour -- there are no substitutes. But if you're halfway through preparing a dish with no time to run to the store, a substitution is necessary; even if it's not perfect. 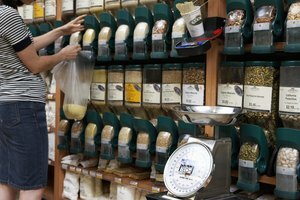 A common ingredient for corn tortillas, tamales and soups, masa harina is a fine, powdery ground corn meal product. It's ground from hominy, which is corn that is boiled in water and lye or lime -- calcium hydroxide -- to remove the kernel from the hull. Fresh masa is a corn dough that's used to make masa harina. The dough is dried out and ground to make masa harina corn flour. Dried corn kernels are boiled in water with lime which breaks up the corn kernel into hominy, making the corn easier to digest. Fresh masa, while sometimes difficult to find, is actually better than masa harina for making tamales and tortillas. Use coarse masa for making tamales and smooth-ground masa for making corn tortillas. Masa harina must be rehydrated to form a dough, but fresh masa is already a dough so you simply roll it out and cook. 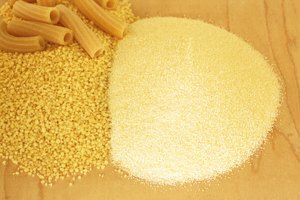 Yellow and white cornmeal are in the baking aisle of any grocery store. While traditional Mexican food recipes call for masa harina to make authentic foods, such as corn tortillas, you can use also plain cornmeal instead. While cornmeal varies in texture, even fine cornmeal is coarser than fine-ground masa harina, so it must be mixed with all-purpose flour to create a final texture similar to the smooth masa harina texture in corn tortillas. For every 2 cups of masa harina called for in a recipe, substitute 2/3 cup cornmeal and 1 1/3 cup all-purpose flour. Unlike fresh masa, ground cornmeal isn't boiled with lime, so you can add a squeeze to your dough if you'd like. Masa harina is often added as a thickening agent for soups, including chicken tortilla soup and chili. The masa harina is mixed with cold water to create a slurry and stirred into the soup where it simmers and slowly thickens. If you're out of masa harina and your soup is too thin, use cornstarch, adding 1 tablespoon at a time, to achieve the desired consistency. Like masa harina, cornstarch is taken from the center of the kernel rather than the whole corn kernel. Mix the cornstarch with about 1 cup of cold water before adding to the hot soup to avoid lumps. Cornstarch is much finer than masa harina -- it's often used in baby powder -- so your soup won't get the same subtle gritty texture it would with masa harina, but you'll have no trouble thickening the broth. 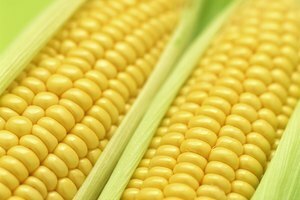 Corn flour works similarly, but it is processed from the whole corn kernel. A staple food in every Southerner's pantry, grits are made from hominy, just like masa and masa harina, which means they're also treated with lime. In many ways, grits are the closest substitution to masa harina aside from fresh masa, but they're much coarser than even the coarse-ground masa used for tamales. While they're not a perfect substitution, if you only have grits on hand, you can whirl them around in a food processor or a mortar and pestle to get them closer to the texture of masa harina. Alternatively, cook the grits into a mush and mash the mushed grits to make masa dough.